I could go for some Krispy Kreme. I wasn't planning on going into spoilers, but considering I'm talking about a movie that just came out I don't think I can go into it without spoiling. So...uh... spoiler warning. Turns out a movie named Power Rangers is about Power Rangers. I was initially pretty luke warm during the initial lead up to the released of the Power Rangers movie, until about November when I started warming up to the new updated designs. The various trailers and commercials made the movie look more like a Freeform tv show than what I wanted, so I was planning to wait until video. As release neared, I found that changing too as I started getting really excited for the release. Thanks to my wife making plans to go to the movies with some friends, I ended up watching it after all opening weekend. And I'm glad, because that was a super fun movie. Now, despite what those early commercials advertised, the ones that were on tv closer to release actually were what the movie offered. A new restart of Mighty Morphin Power Rangers as a big budget Hollywood movie series. Unfortunately that segways into my biggest complaint with the movie. It's the first part of a new super hero movie series, meaning the bulk of the movie is set up. Now, that's not a bad thing as the movie gets right to the point. After a short bit of bringing the kids together and putting them into the situation where they become Power Rangers, we basically have to watch them grow into the part over the bulk of the movie. It's not terrible, in fact its done pretty well. Just as someone who's there for the costume action and robots fighting monsters, it feels like an eternity. The new updated version of the classic team is given a bit more depth as characters, though some of the angsty teen bits feel a bit over used. Of course, I'm no longer a teenager, so that particular style of drama probably doesn't appeal to me any longer. The new in movie universe history for the Rangers, Zordon, and Rita is pretty well worked out. It makes for a decent set up and even gives Zordon some much needed depth. In fact Rita was a lot of fun. Not just some cackling witch who sends monsters to earth, she's a hands on villain who's probably a little too scary for children. By the end of the movie, the only thing I was still unhappy with was Goldar. Goldar was not used in a way I liked. Now, the way he was used would be perfect for any generic monster, just going in with the name Goldar still rubs me the wrong way. Classic Goldar is a great cheesy villain with a classic look. This is literally just a monster made of gold with no personality. However the way he's used is pretty cool, I'll just have to get over the name when I watch the movie again later. The big Ranger action scenes are satisfying in a way I didn't expect. The Rangers fight Putties with slick martial arts while exchanging corny banter before taking the Zords out in a giant fight scene which is pure adrenaline for fans of this kind of stuff. During the action, the Tyrannosaurus Zord steps on a familiar yellow Camaro and throws it at a group of Putties. This scene erupted in laughs from the audience as Jason delivers the line of the movie, "sorry Bumblebee". I really liked this part a lot. Usually Zords only get a brief bit of screen time before they form the Megazord, while here we see them fighting all over the place. The intro bit of them running to battle with the classic Power Rangers theme playing was pure joy. In the end we get some classic Ranger cameos and a fun hint of the subject matter of the next movie. 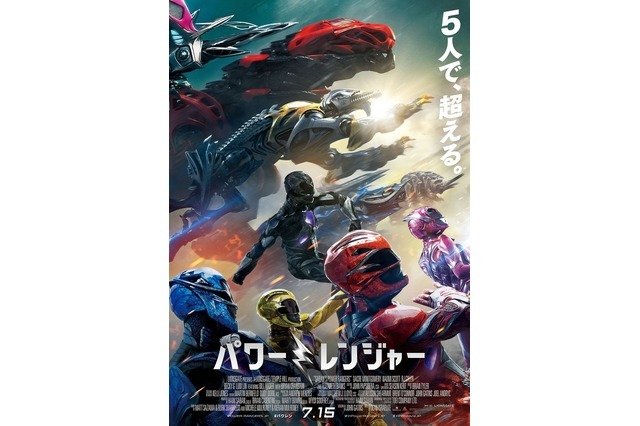 In all it was a much better movie than I anticipated (though I really could have used more Rangers in costume scenes) and I left happy. Also craving donuts as the Krispy Kreme product placements were rampant, though pretty well done. The scene where amidst the chaos, Rita enjoying a plate of fresh Krispy Kreme donuts was pretty funny. I thoroughly enjoyed the movie and am happy I saw it. Considering it's a movie more aimed at teenagers in a theater full of children and middle aged nerds, it still fared pretty well with all us watching. I'm looking forward to future installments and hoping for a neat special edition of the blue-ray.